Located about 600–700 light-years away from Earth in the Ophiuchus constellation, Barnard 59 forms the mouthpiece of the Pipe Nebula and can be seen in great detail in this image captured by the Wide Field Imager on the MPG/ESO 2.2-meter telescope at ESO’s La Silla Observatory. Just as René Magritte wrote “This is not a pipe” on his famous painting, this is also not a pipe. 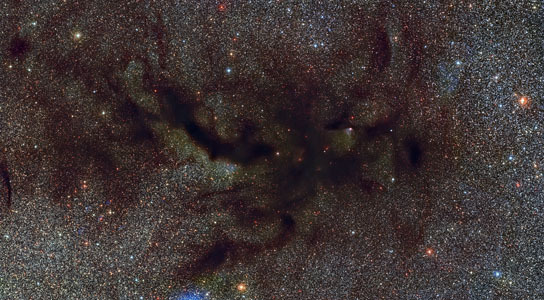 It is however a picture of part of a vast dark cloud of interstellar dust called the Pipe Nebula. This new and very detailed image of what is also known as Barnard 59 was captured by the Wide Field Imager on the MPG/ESO 2.2-metre telescope at ESO’s La Silla Observatory. By coincidence this image is appearing on the 45th anniversary of the painter’s death. The Pipe Nebula is a prime example of a dark nebula. Originally, astronomers believed these were areas in space where there were no stars. But it was later discovered that dark nebulae actually consist of clouds of interstellar dust so thick it can block out the light from the stars beyond. The Pipe Nebula appears silhouetted against the rich star clouds close to the center of the Milky Way in the constellation of Ophiuchus (The Serpent Bearer). This pan video gives a close-up view of part of a vast dark cloud of interstellar dust called the Pipe Nebula. This new and very detailed image of what is also known as Barnard 59 was captured by the Wide Field Imager on the MPG/ESO 2.2-meter telescope at ESO’s La Silla Observatory. 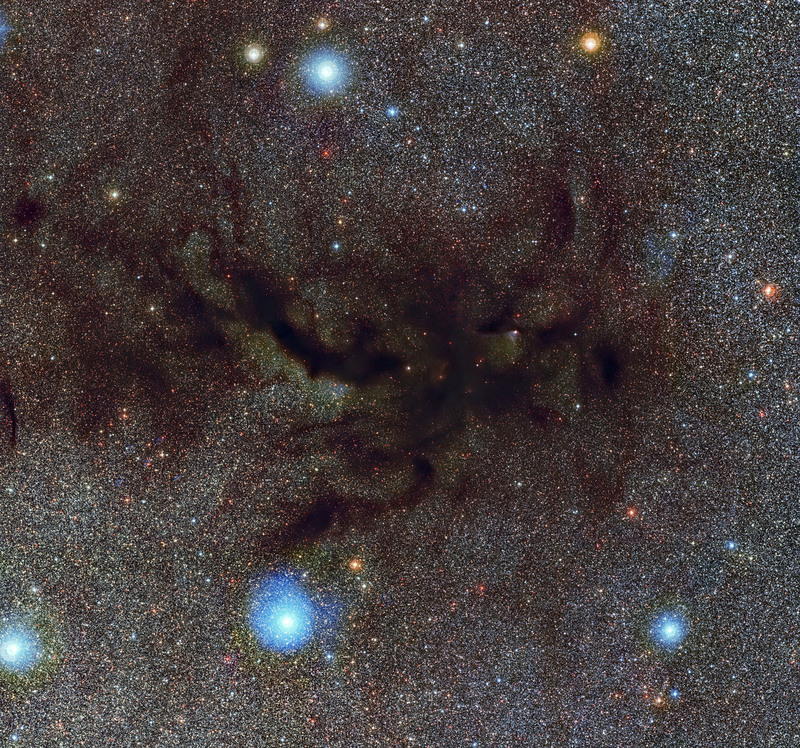 Barnard 59 forms the mouthpiece of the Pipe Nebula and is the subject of this new image from the Wide Field Imager on the MPG/ESO 2.2-meter telescope. This strange and complex dark nebula lies about 600–700 light-years away from Earth. The nebula is named after the American astronomer Edward Emerson Barnard who was the first to systematically record dark nebulae using long-exposure photography and one of those who recognized their dusty nature. Barnard cataloged a total of 370 dark nebulae all over the sky. A self-made man, he bought his first house with the prize money from discovering several comets. Barnard was an extraordinary observer with exceptional eyesight who made contributions in many fields of astronomy in the late 19th and early 20th century. At first glance, your attention is most likely drawn to the center of the image where dark twisting clouds look a little like the legs of a vast spider stretched across a web of stars. However, after a few moments you will begin to notice several finer details. Foggy, smoky shapes in the middle of the darkness are lit up by new stars that are forming. Star formation is common within regions that contain dense, molecular clouds, such as in dark nebulae. The dust and gas will clump together under the influence of gravity and more and more material will be attracted until the star is formed. However, compared to similar regions, the Barnard 59 region is undergoing relatively little star formation and still has a great deal of dust. If you look carefully you may also be able to spot more than a dozen tiny blue, green and red strips scattered across the picture. These are asteroids, chunks of rock and metal a few kilometers across that are orbiting the Sun. The majority lie in the asteroid belt between the orbits of Mars and Jupiter. Barnard 59 is about ten million times further away from the Earth than these tiny objects. And finally, as you take in this richly textured tapestry of celestial objects, consider for a moment that when you look up at this region of sky from Earth you would be able to fit this entire image under your thumb held at arms-length despite it being about six light-years across at the distance of Barnard 59. Be the first to comment on "Detailed Image of Barnard 59, The Mouthpiece of the Pipe Nebula"